If you're looking for 'Pad powered keys these are our new favourites. Ultra portable. Playable action. Plug in and play convenience. No iPhone 5 cable (yet). Officially the smallest and lightest (while still actually worth playing) iOS-ready keyboard you can buy. 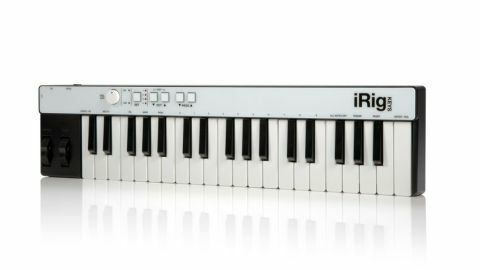 "iRig Keys takes it's power from the device and works like a charm in Core MIDI apps such as GarageBand, Korg's iMS-20"
The key's are chunky and stiff with a nice cushioned, bouncy playable action that reminded us of old 'Portasound' keyboards and the addition of Volume/Data, Program change and Octave Up/Down buttons mean that it's the fullest featured iOS keyboard. The proprietary mini DIN to 30-pin lead is a slight inconvenience (and there's no Lightning connection for iPhone 5 yet). It takes it's power from the device and works like a charm in Core MIDI apps such as GarageBand, Korg's iMS-20, and IK's own Sampletank LE which comes free in the box.